I'm not sure how long it will take me to catch on to this but after 4.5 years as a parent I am still always surprised by the things that my kids will spend hours playing with. It is rarely all the toys we have and almost always the simplest things that get the most attention. 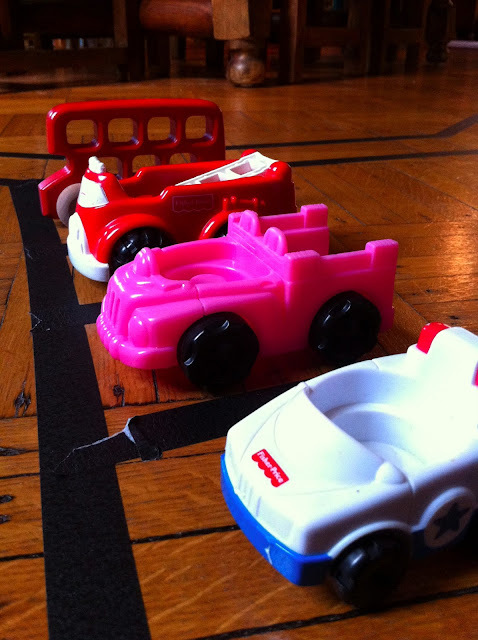 A few days ago I was looking through the Family Fun Magazine and saw a great spread on a taped roadway on the floor. I have seen this other places and had been meaning to try it. Since the last few weeks have been either very rainy or bitterly cold here, I have been desperate for some good inside play ideas. So I broke out some colorful paper tape we have and just started making a road around the dining room table. We added some parking spaces and more roads and over the next few days even added a park. The girls have spent a lot of time over the last week playing, adding cars, little people, figures and all kinds of stuff to the scene. The tape is very alluring and I have found even adults who have come to visit have a hard time passing by with out getting down to play a little. After a week the tape is starting to peel up in spots so this morning the Bean and I spent some timing pulling it up. A job she surprisingly loved, since I was worried some tears might be shed when the tape came up. The Bee was a little sad to see it go but was happy when I told her we could make another one. She is already planning out what our next set-up should be. The tape we used is a from a set of colorful masking tapes we got last winter but you could also use painters tape. 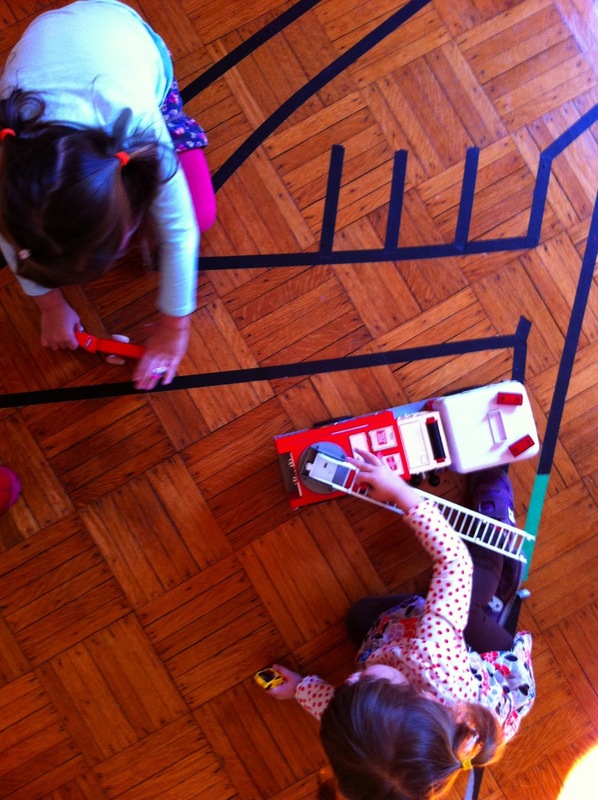 I love this tape and we have used it to walk the line, play hopscotch and do floor puzzles. I would love to hear from others about some of their favorite ways to play with tape!